David Cameron had another blast against binge drinking today but failed to come off the fence about whether he wants to press ahead with legislation that would price cheap booze out of the supermarkets. Moves are already underway to lift the cost of alcohol but nothing will be as effective as introducing a minimum price per unit, as Scotland is considering. It would be aimed at deterring drinkers who tank up at home before hitting town centres where they proceed to complete the damage at an estimated £1 billion a year to the emergency and accident services. The harm to the wider society from alcohol related causes is many, many billions more. Minimum pricing is unfair on moderate drinkers especially the less well off who will be denied, for them what is an innocent pleasure. 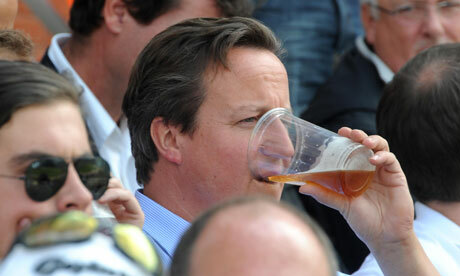 The Prime Minister knows all about youthful binge drinking as a former member of the Bullingdon drinking club in his student days. The tipple was Champagne. Then as now young toffs will not be denied the demon drink; but neither will the rest of the population. Getting hammered is engrained in the British character, as Hogarth’s prints of 18th century gin-swilling Londoners remind us. Extending licensing hours didn’t inject Continental savoir faire into British drinking; it just meant the rolling drunk of both sexes hit the streets later. Raising the minimum price of alcohol per unit so that it bites will present binge drinkers with a challenge, which will be met by a rise in smuggled alcohol, the growth of moonshine, and increased drug use. It would be nice to think a campaign starting with children of primary school age could educate them in the virtues of moderation by the time they come to have their first drink. I’m rarely defeatist but on this one I can’t see how you convince young people that getting pissed out of their heads with their mates is anything other than fun except save for literally putting the fear of God in them. And that won’t work for the pagan British.